When my cousin asked me to accompany her to buy a laptop, I agreed instantly because I knew she’ll going to treat me. She asked me some suggestions of good restaurants to eat to and I told her, Papa John’s. The first time I’ve known this restaurant was when they opened a branch in Robinson’s Galleria. I love pizza and pasta so I was really longing to try out this one when they branched out in Megamall. Their menu typically consists of Pizza, Pasta, Soup and Salad, and with Side items like cheese sticks, bread sticks, and potato wedges. To check out their menu, you may click this link. Their pasta are already good for 2 so we ordered two pasta for the 4 of us, 12″ medium sliced pizza and potato wedges. 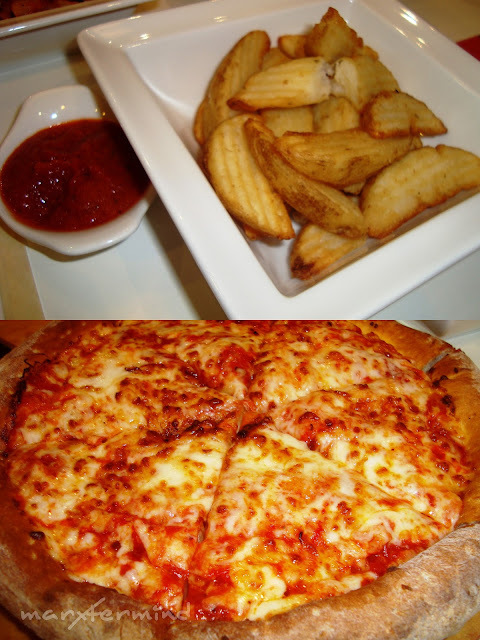 Papa John’s Potato wedges (PHP 90.00) are fried unpeeled wedges of potato seasoned with salt and spices. This is a variation from the common french fries and mojos. 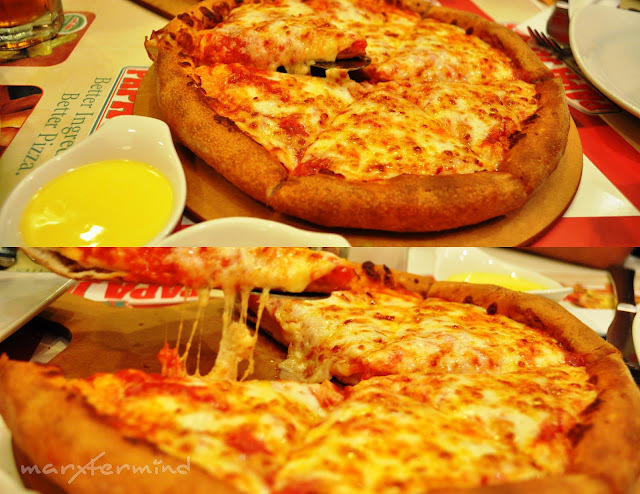 For pizza, we had Simply Cheese pizza (PHP 360.00). I discovered something delicious here. 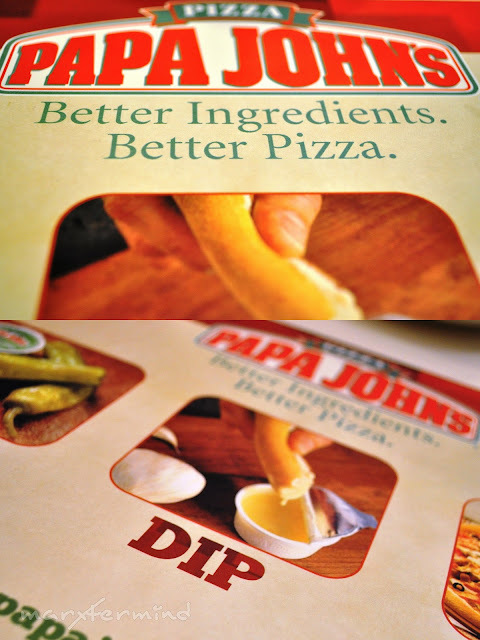 Pizza is perfectly great when dipped in butter! Yes, the taste was so good, pizza and butter were perfect match. All in all, our order costs PHP 891.00 (including 10% service charge). It was a great treat, indeed. My cousin asked me again if it’s okay if her friend use my credit card to purchase an installment item. I thought about it at first but agreed after a while. She told me that her friend will treat us dinner in exchange of using my credit card, and I was delighted with the idea. My cousin can’t get enough of Papa John’s so we ate there once again. It’s weekend and the restaurant is full of diners. It only shows that Papa John’s is winning a lot of satisfied customers. 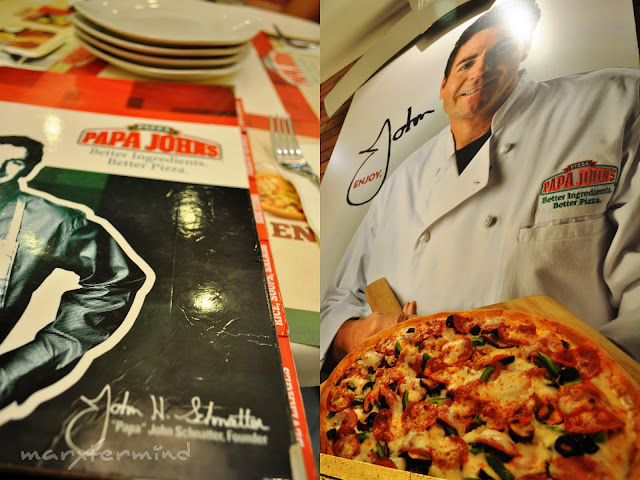 So this is Papa John, the founder. We ordered the same pizza, Simply Cheese (PHP 360.00). 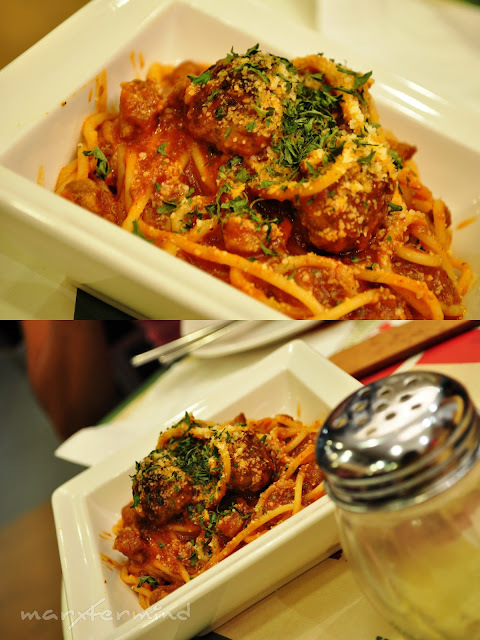 For pasta, we ordered Pasta Bolognaise with meatballs (PHP 195.00) for a change. I slightly don’t like it because it’s meaty. 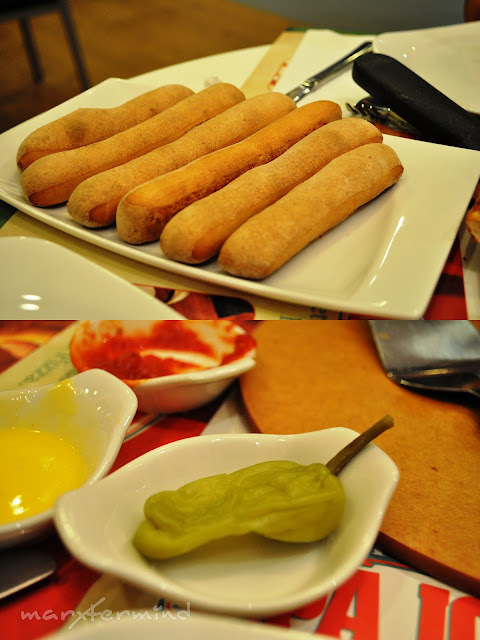 For side items, we had Bread Sticks (PHP 70.00). Papa John’s is my new favorite Pizza and Pasta restaurant. 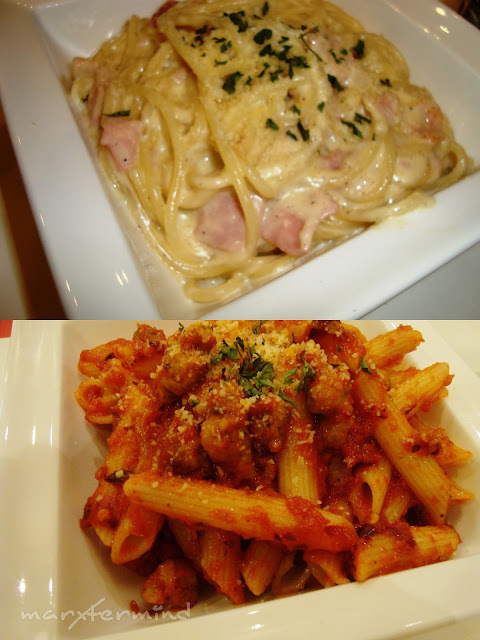 Not only because of its affordable food selection but the better ingredients that made its pasta and pizza better. Three months after graduation, finally my brother has work already. It’s a tradition to treat family on the first salary so I asked my brother to treat us for dinner. He agreed. He wanted to eat at Papa John’s but I told him I had just eaten there yesterday so I recommended Peri Peri to him. Also known as Piri piri, is a cultivar of Capsicum frutescens, one of the sources of chili pepper, that grows both wild and domesticated. It is a small, extremely spicy member of the Capsicum genus. We ordered their group meal cost (PHP 6++.00 – I forgot the exact amount). 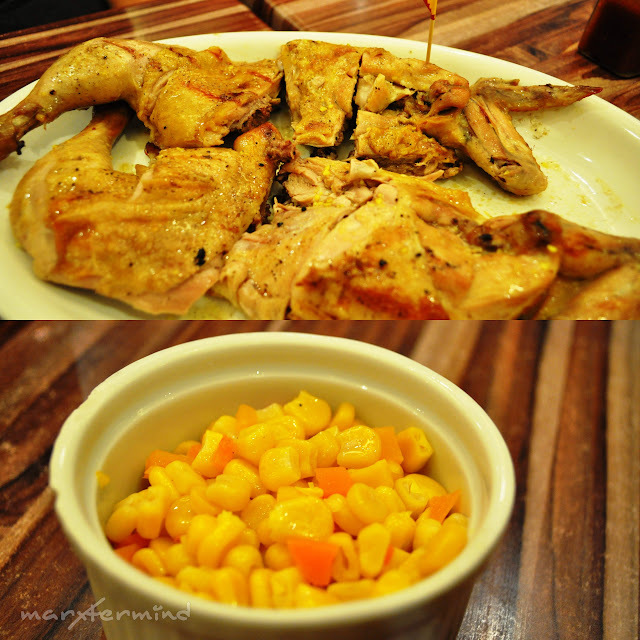 The meal consist of 1 whole chicken (garlic or spicy), large java rice and 4 side dish which includes 2 coleslaw and 2 corn & carrots. Soup choices are mushroom soup and corn soup. Beverages includes cold drinks, tea and coffee. I like the corn soup, much better than the mushroom soup. Hope they have this in makati. would like a taste. ma-munchpunch nga 'to. fumu-food trip ka na naman ha. Thanks for this. Napapansin ko lately lagi na lang akong nasa comfort zone when it comes to food choices. Bentang benta si Papa John. hahaha! Try ko nga din kung yummy siya talaga. lol! I thought the butter dip was just your idea. Sidings pala talaga. hahah! Hindi kaya sumakit ang batok ko sa cholesterol? 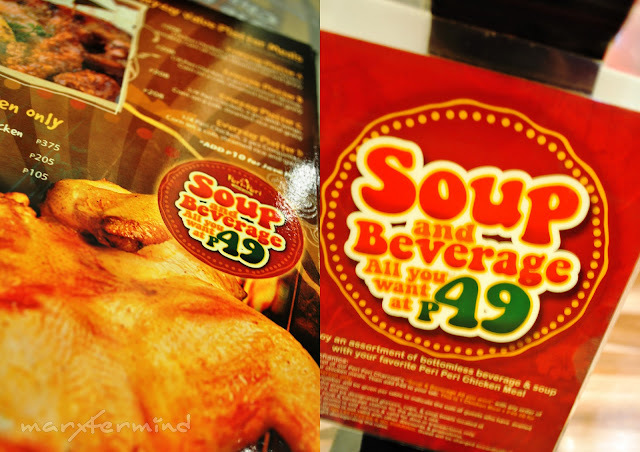 Soup and beverage for P49.00?! napaka-sulit naman nun. Pwede ba yun na lang ang orderin at isang tasang kanin. hahah! Solb nako dun promise.